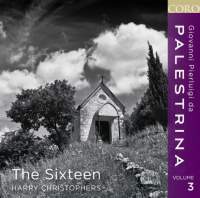 This programme on this superb release, the third in The Sixteen’s series devoted to the music of Palestrina, takes, like the previous two volumes, a single theme and a single Mass as its starting point. In this case the theme is Easter, the Mass is the five-voice Missa ‘Regina coeli’, published in 1600, 46 years after Palestrina’s four-voice Mass based on the same Marian antiphon. Also like the previous two volumes (reviewed in September 2011 and December 2012) it includes a selection of Palestrina’s settings of the Song of Songs, the three motets presented here balanced by three offertories for the Easter period; between the two groups falls Palestrina’s eight-voice Regina coeli, which like his two Masses of the same name paraphrase the original chant. The recording, however, opens with a luminous, stately performance of Palestrina’s Stabat mater for eight voices split into two choirs, the strength and clarity resulting from the largely textures and antiphonal dialogue between the choirs animated by Harry Christophers’s flexible direction. Alternating chant with polyphony, the four-voice Easter hymn Ad coenam Agni providi which follows feels open and spacious by comparison — a perfect lead-in into the more sensuous, madrigalian Song of Songs settings for five voices. It is in the Song of Songs we find The Sixteen and Christophers at their most subtly beguiling, the rich imagery of the texts — vineyards, flocks of sheep and goats, cheeks ‘beautiful as doves’ and Palestrina’s classical, understated word-painting brought out with a graceful, mellifluous sonority and supple phrasing. Following the joyful Regina coeli, The Sixteen adopt a more sober though no less expressive and intense attitude in the three offertories, best typified by the last one, Terra tremuit, its triumphant lilt and resounding ‘Alleluia’ seeming to ask the listener to compare its text with that of the Regina coeli. Another nice symmetry. The final item on the recording is the Missa ‘Regina coeli’, in which the original antiphon chant is subjected to various deconstructions and transformations both directly and through counterpointing original melodies. This is another very fine performance, singers and conductor responding to the great variety inherent in both text and music with a kind of relaxed energy — listen, in particular, to the ‘Credo’. 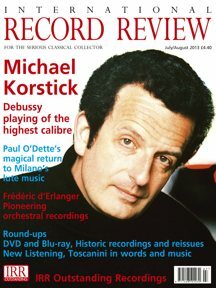 As such, it perfectly exemplifies Christophers’s approach as outlined in his introductory booklet note: ‘We have attempted to achieve real ebb and flow in [Palestrina’s] music, not clipping the ends of phrases but allowing the music to breathe, to convey the real meaning of the words and making our breaths part of the music as a whole’ .